As a fan of “The Conjuring” movies, when I saw there was another prequel, I was ready for a similar, scary movie experience. “The Nun” tells the story of a priest (Demian Bichir) and a nun (Taissa Farmiga) who hasn’t taken her vow. They are sent by the Vatican to investigate a suicide at a convent in Romania. They must confront an evil demon who is posing as a nun. 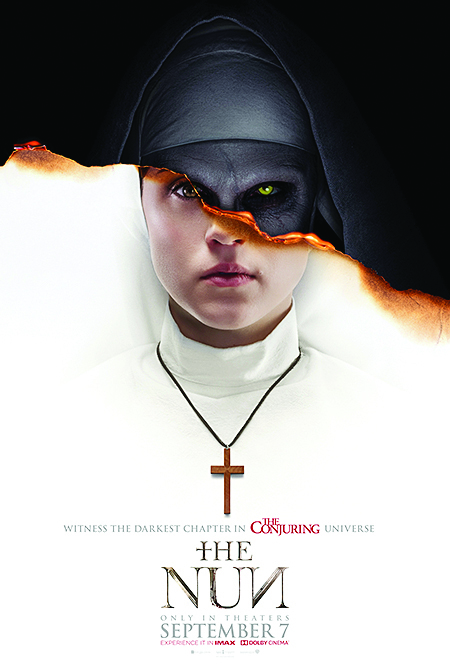 The opening of the movie foreshadows an evil spirit who has taken over a convent. The camera passes over a sign that reads ‘God ends here’ in Latin. Ominous music and a dark, low lit atmosphere set the tone for this horror movie. You hear a nun say, “evil needs a vessel to escape.” After which she jumps out a window hanging herself. Shortly after, a man known as Frenchie (Jonas Bloquet), comes across the hanged body. He puts it in a mausoleum out of respect. Sister Irene tells Father Burke of how, as a child, she had visions involving the demonic nun. Later on, Sister Irene is told by other nuns in the convent the only way to combat the demonic nun is to pray. She enters a chapel where nuns are praying and suddenly, one of the nuns is killed. Sister Irene looks around and notices all the nuns in the chapel are laying dead on the floor. “This place is no longer holy,” states Sister Irene. The demonic nun attacks Father Burke and Frenchie saves his life. The three must defeat the demonic nun and seal up the evil portal that has been open inside the convent for too long. Will they be able to defeat the demonic nun and prevent her return? I found this movie entertaining, but not as good as “The Conjuring” or even some of the other movies in the franchise. “The Nun” has some predictability. There are several scenes that will make you jump, along with some plot twists. Creepiness is all over this movie: Sister Irene is followed by a shadow, Father Burke is buried alive, the demonic nun makes a few appearances including one in which she carries a noose (taunting Frenchie of the suicide) – good for a movie scare when you see these parts. The music is ominous; chanting, loud pounding and suspenseful which add to this movie’s eerie tone. The dark and foggy setting of a haunted convent is an ideal setting. Without giving too much away, Ed and Lorraine Warren (Patrick Wilson and Vera Farmiga) make an appearance. If you are a big fan of “The Conjuring” and its other films and don’t want to wait for the DVD release, I would recommend you see this in theaters. It’s a decent horror movie, more jumpy than scary. Is it absolutely necessary to see this in the theater? No. You’ll jump just as much when you watch it on DVD.